The landscape of Matera, a small town in Basilicata, southern Italy, could easily be mistaken for the Holy Land, with its ancient buildings hanging on to the hillside. In fact the area has been used by Hollywood to give just such an image, when Mel Gibson shot the film “The Passion of the Christ” there back in 2003. When choosing to travel to Italy, Matera is a fascinating and unusual destination to visit. Besides its historic and ancient buildings, the town is the site of a honeycomb of caves, dotting its canyon walls. Dug into the soft rock around 9,000 years ago, these caves were home to Paleolithic and other ancient people. According to UNESCO, the caves are the best example of a troglodyte settlement in the Mediterranean, but in more modern times, they have been the shame of Italy. Up until not too long ago, the poor of the town crammed into these caves, living in squalor and filth. In what was known as Sasso Caveoso and Sasso Barisano, the residents had no light, heat or sanitation and illness was rife. It was around 1952 that things finally began to change and local management moved some 20,000 residents from the caves and rehoused them in modern buildings. From then onwards the sassi, as they are known, remained abandoned and empty and some were even bricked up. Later, hippies moved in, trying to make a home in the caves, and it was finally due to their influence that everything changed. The council connected these new residents to the town’s utility services and the caves had a new beginning. Gradually one cave became a tiny café, another a small art gallery and a community of writers and artists moved into the sassi. 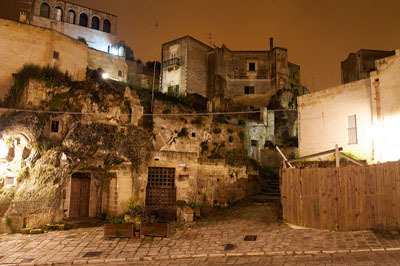 With this gentrification, Matera caught UNESCO’s eye and in 1993 the sassi were declared a World Heritage Site. Now the town is considered to be chic – not bad for a slum that had been the shame of the country! As reported in the Telegraph, some of the caves have been transformed into comfortable homes and many more have become boutique hotels, like Sextantio Le Grotte della Civita. While the hotel is considered a luxury hotel, there is no pool. You will find no conveniences like televisions, minibars or phones and little modern adornment in the rooms. The luxury is the very experience of staying there and the décor comes from the origins of the sassi. While the hotel does have a reception area and restaurant, the rest of the rooms are spread around the hillside as a community. There are several other hotels in Matera and a variety of restaurants and bars to choose from, so anyone who might feel a little claustrophobic in a cave has a wide choice. Dining in Matera tends to hark back to the past with many of the traditional dishes still served. The streets of the sassi are a labyrinth, fascinating to explore, and totally car free, with winding pathways and endless steps, carved from the rock.